This giveaway was ended. And here are the Lucky winners of Premium WordPress Themes from Themefuse. Congratulations for all winners. Subscribe to our newsletter to know future giveaways right there in your inbox. Winners are already informed through email. You will recieve a mail shortly from Themefuse. Please contact us if you have any queries. Our friends at ThemeFuse are ready to share WordPress themes a unique opportunity with you as a thank you for reading! If you are already utilizing WordPress for your Internet blogging, enter today’s giveaway. 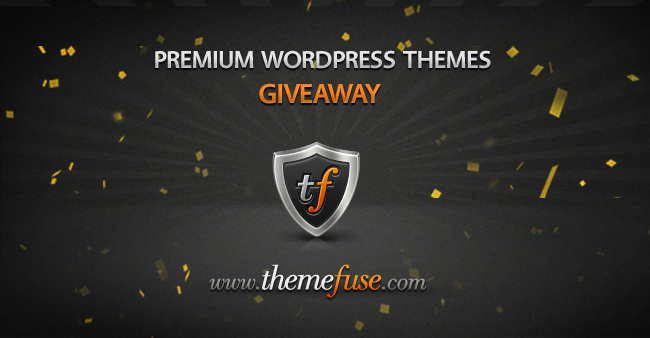 The winners will be able to take advantage and download a WordPress theme from ThemeFuse. There is no cost and you will be able to choose the one that is right for you. Tell us about yourself and your theme needs by adding a comment to this post. Be sure to tell us where and why you want to use this theme and what you would do if you won. Be sure to tap the like button on the ThemeFuse page on Facebook . Giveaway starts : 25 September 2013. Ends: 4th October 2013. Be sure to stay in touch as the winner will be announced on Twitter and Newsletter. Note: when commenting, don’t forget to leave your email address on our form (will not be shared publicly, no spam) so that we can contact you in case you win! Three Lucky winners will get a Free copy of your favourite themefuse theme. You can also follow us on twitter or Subscribe to our newsletter to recieve more awesome freebies, resources and giveaways like this. Check back this blog post later to find the winners. Winners will also recieve a mail regarding it. When it comes to the world of WordPress themes, ThemeFuse is at the top of the list as one of the most premier providers. With so many options, you are sure to find a WordPress theme that will meet your needs through ThemeFuse. Style and design come together fluidly in these themes. They are well constructed when it comes to coding as well. There are unique features and options from which to choose as well to ensure you get everything you need. The samples below are just some of the amazing themes WordPress templates which ThemeFuse has created. If you are looking for graphically stimulating design and need a creative approach, this theme is perfect for your needs. Videos, photos, and other media can be added to a portfolio or personal blog that even links to your iPhone. What you should do today, then, is sign up and get in on the giveaway. Winners can choose the ThemeFuse theme they want and make use of it in the way that they need. It really is as simple and easy as that.